There aren’t many brands whose whole range gets me excited, but Aurelia Probiotic Skincare grabbed my attention from the moment this young British brand stepped into the spotlight. A few years later, with multiple stockists & a legion of fans, the brand expanded into skincare for babies, launching Little Aurelia a few months ago. And my kids, who no longer fit a ‘baby’ or ‘toddler’ category, turned out to be willing tester volunteers. Designed for babies & young children, Little Aurelia blends together gentle, but effective botanical ingredients with soothing essential oils that help to calm & settle precious cherubs to sleep, allowing mum to enjoy the nurturing aspect & get some well deserved shut-eye as well. The range also aims to support your little one’s wellbeing from the first months of life, thus giving them the best start, when their bodies are at their most vulnerable, having emerged from the safety of mother’s womb into our unpredictable world. It was very important for Claire Vero, brand’s founder, to create products that help nurture babies & children’s delicate natural barrier. Why? I think the inspiration behind her new brand are her own children, particularly her first-born son called Henry. Motherhood might initially make your brain hazy & body tired, but it gives you a consistent urge to create & do things that will also bond you with a baby through comforting bedtime rituals, including reading. 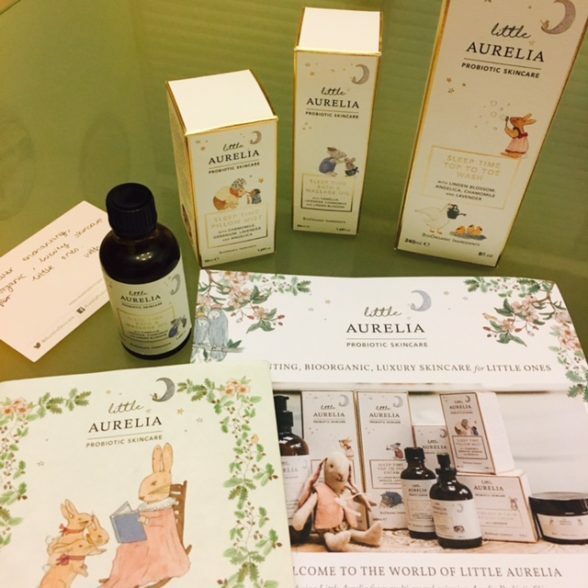 When my Little Aurelia parcel arrived, it contained three products: ‘Sleep Time Top to Toe Wash’, ‘Sleep Time Bath & Massage Oil’ & ‘Sleep Time Pillow Mist’. Charmingly, it also contained an adorable Little Aurelia book of poetry, ‘Sleep Time Tales’. The book introduced a host of illustrated Woodland Friends, like Little Ruby Rabbit, Ottilie the Bunny, Arthur the Mouse & Cecil the Cat. On the first evening, my daughter asked to read the book – she did a few pages herself, reading the poems to me & then I took over. We decided to extend the pleasure and read the book on two consecutive evenings but even now, a couple of months later, we occasionally grab it off the shelf & re-read it in the cosy & calm comfort of the bedroom. Bonding over a book, when you get to discover the wonderful world of magical characters with your children, is one of life’s pleasures for many of us, as we get to re-live our childhood through our children’s eyes, full of delight & wonder. This sulphate-free hair & body wash uses creamy Coconut oils that cover your child in a gentle lather, cleansing the skin without stripping it (just make sure the bath water is warm & not hot, as it can make the skin drier) & make hair soft & manageable. When I use it on my daughter or she uses it herself on her sponge, we often forego the moisturiser & hair conditioner, which is a testament to the nurturing aspect of the formula. Ingredients wise, you have Little Aurelia unique sleep time blend (please see the product masthead), as well as Aloe Vera to hydrate, Oat kernel & Calendula to sooth and Apricot, Avocado & Starflower oils to nourish the skin & the hair, which is much more delicate, if not fragile, compared to us adults. My daughter & I also appreciate the delicate scent that lingers & doesn’t overwhelm the senses, not irritate them or the skin. I firmly believe that gentle skincare & haircare formulas used from the first days of baby’s life will hopefully set a great foundation for your child’s wellbeing, as well as future choices when it comes to their own hair & skincare product selection. I constantly have discussions about products, rituals & ingredients with both of my children, as I observe & hear what many mothers use on their children, often not giving it a second thought, as we all speed through life. Educate yourself & then guide your children, it will create another bond between you & hopefully will help them make better choices in the future, when they become teenagers and then young adults. We live in the world that isn’t becoming more environmentally friendly fast enough & sadly it has a negative impact on our long-term health & wellbeing. This snooze inducing oil gently soothes muscles (babies move a lot, as they get to know their own bodies) & nurtures the delicate skin. The lightweight oil formula, that also contains flower essences, sinks in quickly into the skin when you give your little one a massage or add a few drops to the bath water – this of course depends on your child’s skin, so doing a patch test before using a new product is always a good idea. I tried this oil on my daughter in the summer, when she complained that her legs, calves in particular, felt a bit sore after an action-packed day at the beach. So I massaged it into her legs, both of us inhaling the delicate scent of lavender, linden blossom & chamomile, as we chatted. My hands moved with ease along the skin and the muscles and my daughter gave me directions, where she wanted more pressure. A few minutes in, she said that her legs felt better already and wondered, if she can have a massage with it the next day. A few days later my eldest pulled a muscle behind the knee and we tried a similar massage technique with the same successful result, which just shows you that this oil can be used not only on babies, but bigger children as well. The scent would probably be more to the liking of a girl than a boy, but of course it all depends on a personal preference. I gave my kids daily massages when they were little & think it is one of the best bonding rituals between mother & child, as well as a chance to improve their muscle tone from early on. I am a big fan of massage & believe that regular massage is very beneficial for your body, irrespective of your age ( unless there are contraindications). This bath & massage oil contains hydrating Coconut, nourishing Sweet Almond, nurturing Jojoba and as I mentioned earlier, is also infused with flower essences of lavender, chamomile & linden blossom, which help to settle & calm the mind, allowing your child to fall asleep quicker & hopefully have deeper, more relaxed sleep at night. If you need extra tips on using this product, hop on Aurelia’s website & have a look at their recommendations. I would also like to draw your attention to the exterior packaging, where you not only can find a full list of ingredients, as well as the ingredients promise, but when you open the box there is a little message for the mom & the cutest, tiniest illustrations as well. I am all for less packaging & a more positive environmental impact, but your little girl might actually want to play with the box or keep her little treasures or figurines in them…..
A delicate infusion of Bitter Orange flower water with Roman chamomile flower, Anjelica root, Ylang ylang, Fragonia branch & leaf, Geranium Bourbon & Lavender Flower Oils, combined with Quartz powder, this mist is something that you can mist on your baby’s blanket or sleep-suit or just in the air around him or her, helping to create a more tranquil atmosphere before bedtime. It can also be used during car/plane/train journeys when the child becomes grumpy & tired. I don’t travel without my face mists & introducing this product to my daughter, explaining why I am NOT a fan of perfume for children made for an interesting conversation, but now she doesn’t ask for one when we are browsing the shops. While this is not a product that was a ‘must’ in my baby skincare kit, I certainly used Evian spray regularly on them & this pillow mist takes the idea a little further. Something that is definitely worth a try when you are nursing at night or when you baby or child is restless or is having nightmares. As Little Aurelia products cost between £22-£34, they are more expensive than other natural ranges for babies & kids on the market, like Weleda Baby or Child’s Farm, but I think quality & long-term effect of ingredients on your child’s skin are worth a consideration. This is a more luxurious range of skincare for the little ones, but I think tired mothers will benefit from using this range as well & that is a gift in itself for those of us who feel guilty about carving ‘me-time’. Turn your child nurturing rituals into family ones, when calm descends & peace reigns.